Replacing your shoes regularly is an important component of maintaining good foot health. Many of us wear shoes past their “expiration” date simply because we are unaware of the indicators that they are worn out. As a general rule of thumb, shoes should be replaced every 8-12 months for most people, or every 500-700 kilometers for running shoes. Some shoes will last longer and some will wear out more quickly. A good indication that your shoes might be approaching the end of their life is if you feel they are not as comfortable and supportive as when they were new. As the materials wear down, the cushioning and support begins to compress and the materials that the shoes are made of don’t “bounce back” as much as they once did. Every foot moves differently in a shoe and mechanical factors will be different for every person. If you are harder on your feet, chances are you will wear out your shoes more quickly than “average”. This is why it is always important to regularly inspect your shoes to determine if they are wearing out a little more quickly than expected. Put your shoe on a flat, even surface at eye level. Most shoes should sit evenly, without tipping or rocking. If theÂ lugs of the outsole are more worn down, the shoe may tip or rock, or even sit at an angle. “Normal” wear occurs at the outside back of the heel and evenly across the ball of the foot. If you notice any excessive wear in any other areas it may be an indication that the shoe is worn out, or that you may need a different type of shoe for your biomechanical needs. 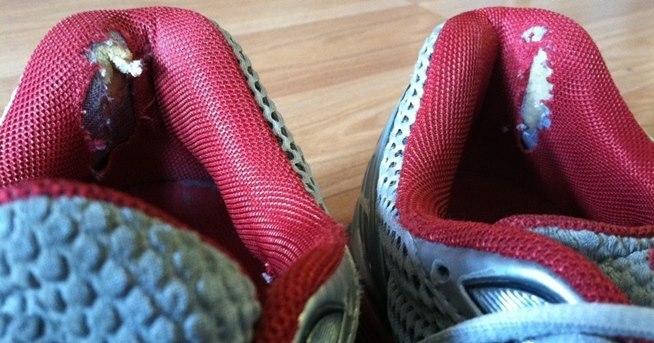 The midsole, or cushioning layer of a shoe is designed to absorb shock during your activity. Typically, this layer is made from EVA which allows for mild compression during activity and rebounds after use. Over time EVA will begin to compress, with visible creases of wrinkles developing. If you notice a significant amount of creaking, the shoe likely needs replacing. Take a look at the exterior of the upper of your shoe. Again, with your shoe on a flat, even surface at eye level, look to see if the shoe is leaning in any direction, or if there is any obvious distortion to the material. If your shoe is distorted, it cannot support your foot in the best way possible and likely needs replacing. Look for any holes or unusual wear. 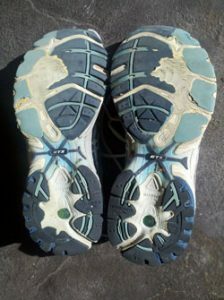 They are indicators that the shoe is over worn and should be replaced. Take a look at the inside of the back of the shoe. Excessive heel counter wear is an indication that the shoe is worn out and needs replacing. If the shoes are less than 6 months old and are wearing out at the heel, the shoe may not be appropriate for your foot. While most people do not need to replace their shoes every 6 months, it’s a good idea to take a good look at them after 6 months of use. This will give you a good indication of how fast you are wearing them down. If you determine that your shoes need replacing and want more information on how to select an appropriate shoes, check out our online resources for selecting an athletic shoe including information on fitting. If you notice any unusual wear or if you have any changes in your comfort or begin to have pain, your SoleScience Pedorthist is always available to answer any of your footwear-related questions. To book an appointment, Contact us anytime! Are you wearing shoes past their expiration date? Our Pedorthists are always available to answer any of your footwear questions. From marathon running to gardening, shoes for the office or sandals for the beach — we have shoes for all walks of life!